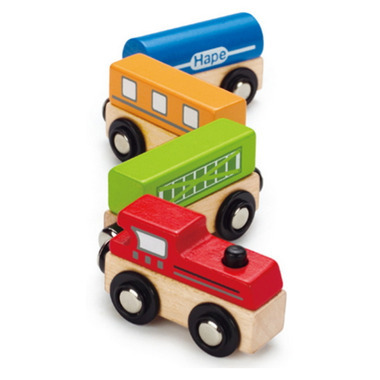 This colorful 4-car wooden train set encourages counting, color identification, story-telling and imaginative play. Count the cars when you see a real train. Identify passenger trains and freight trains. Smaller than i was expecting but enjoyable toy nonetheless. My daughter has had them from about 12 months old and we have been bringing it to the park to roll on the slides and test sticking them on things. My 25 month old loves these trains, keeps him busy. Very good quality for the price. My 18-month-old child loves playing with them.